At the June 2016 General Membership meeting our special guest speaker was Eileen Wagner, author of The Ghost City of San Luis Island. We also viewed our digital copy of an old promotional move about Alvin. 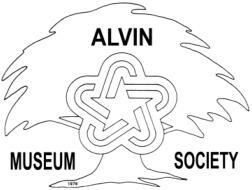 GENERAL MEMBERSHIP MEETING Sunday, June 26 2:00 pm 309 W. Sealy Street (Alvin Senior Center) Join us at the upcoming Alvin Museum Society General Membership Meeting to hear author, Eileen Wagner review her book. "The Ghost City of San Luis Island". Based on historical events from the 1500’s to the present, the book describes an in-depth look at the City of San Luis and its people through newspaper clippings, maps, documents and narrative collections along with several rare photos that have never been made available to the public before.